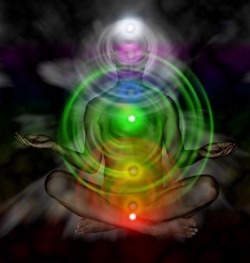 The word Chakra is Sanskrit for wheel or disk. It signifies one of seven basic energy centers in the body which are the openings for life energy to flow into and out of our aura. Each of these centers correlates to major nerve ganglia branching forth from the spinal column. In addition the Chakras also correlate to levels of consciousness, archetypal elements (Jungian concepts), developmental stages of life, colors, sounds, body functions, and more. 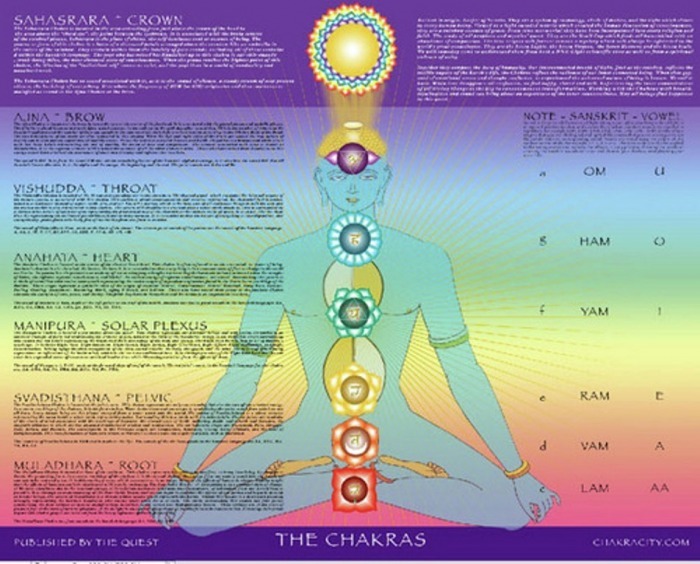 Below is a brief description of each Chakra, including a shape and color which is considered significant . Chakra One: MULADHARA . Bija Mantra LAM .Earth, Physical identity, oriented to self-preservation. Located at the base of the spine, this Chakra forms our foundation. It represents the element earth, and is therefore related to our survival instincts, and to our sense of grounding and connection to our bodies and the physical plane. Ideally this Chakra brings us health, prosperity, security, and dynamic presence. The second Chakra, located in the abdomen, lower back, and sexual organs, is related to the element water, and to emotions and sexuality. It connects us to others through feeling, desire, sensation, and movement. Ideally this Chakra brings us fluidity and grace, depth of feeling, sexual fulfillment, and the ability to accept change, creativity. Chakra Three: MANIPURA. Bija mantra RAM. Fire, Ego identity, oriented to self-definition, personal power. This Chakra is known as the power Chakra , located in the solar plexus. It rules our personal power, will, and autonomy, as well as our metabolism. When healthy, this Chakra brings us energy, effectiveness, spontaneity, and non-dominating power, charisma, radiant health. This is the Chakra located in the throat and is thus related to communication and creativity. Here we experience the world symbolically through vibration, such as the vibration of sound representing language. Intuition, spiritual and prophetic dreams, high creativity. This Chakra is known as the brow Chakra or third eye center. It is related to the act of seeing, both physically and intuitively. As such it opens our psychic faculties and our understanding of archetypal levels. When healthy it allows us to see clearly, in effect, letting us "see the big picture." Activated, Ajna chakra bring us High intelligence, discernment, discrimination, strong memeory, as well as psichyc faculties as teleportation, out of body experiences, astral visions, prophetic dreams, knowing present/future etc, deep meditation states. This is the crown Chakra that relates to consciousness as pure awareness. Some refer to it as a "god source." It is our connection to the greater world beyond, to a timeless, spaceless place of all-knowing. When developed, this Chakra brings us knowledge, wisdom, understanding, spiritual connection, and bliss - States of Samaddhi. Chakra Eight is the Kundalini Chakra or BRAHMARANDRA. The Three Channels of Energy. Left and Right Cerebral Hemispheres. Abilities. The Three Channels Among these 72,000 Channels, the three are of special importance. They are: Sushumna in the center, Ida on the left, and Pingala on the right. *Ida (The left Channel) Ida starts on the left side of the coccyx, goes through the Chakras on its way and ends on the left side of the Ajna Chakra. 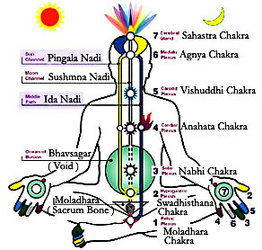 *Pingala (The Right Channel) Similarly, Pingala starts on the right side of the coccyx, goes through the Chakras and ends on the right side of Ajna Chakra. *Sushumna (The Central Channel) Sushumna, or the central channel - The energies are sublimed as Kundalini and go up this channel. If Sushumna is clogged, there is no ascent of Kundalini. The only way to get rid of attachments is to purify the central channel, and let Kundalini to ascent only on Sushumna channel. Telepathic Ability resides within both hemispheres' the Corpus Callosum Channel within the Human brain. The Corpus Callosum is the bridge between normal and supernatural ability. It was while I was studying peripheral vision with a mirror that I came across the process I had noticed that if I projected telepathically the returning message would also pass through a channel about half an inch above the left ear and while using telekinetic ability the energy seem to move through the same area but in the right hemisphere Meaning that the channel was central but bordered between the two hemisphere at the same time . The Cerebellum is the center of the casual body or etheric body, as it is known. Once this is opened energy begins to awaken the telekinetic channel that resides in the right hemisphere of the Corpus Callosum. Here lyres the ability of telekinesis, invisibility, and levitation. 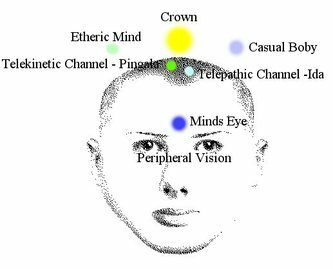 Telepathy is possible when the cerebellum is open to the etheric plain the thought from my understanding is formed at the pineal center and projected through the minds eye into the etheric body. I have notice telepathy coming in as it moves through the etheric into the minds eye and into the left channel above the left ear known as the Corpus Callosum left hemisphere. This is the process for mind-to-mind telepathy; the throat center is also used with speech telepathy. It is likely that the left channel links to the left ear. As I have heard whispers in my left ear while this channel is active. 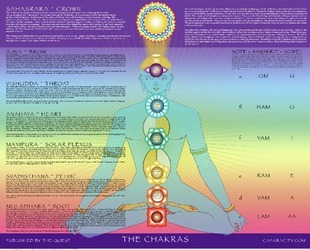 What we have here starting at the top is the crown chakra and hara line. 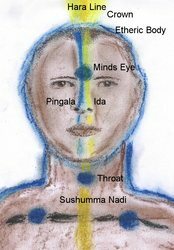 As we move down we enter into the three channels of sushumma nadi, Ida, and pingala, which pass through the minds eye. Ida is a telepathic channel, and Pingala is a telekinetic channel. Both start at the left and right nostrils and pass along the upper part of the skull and down along the spinal collum. 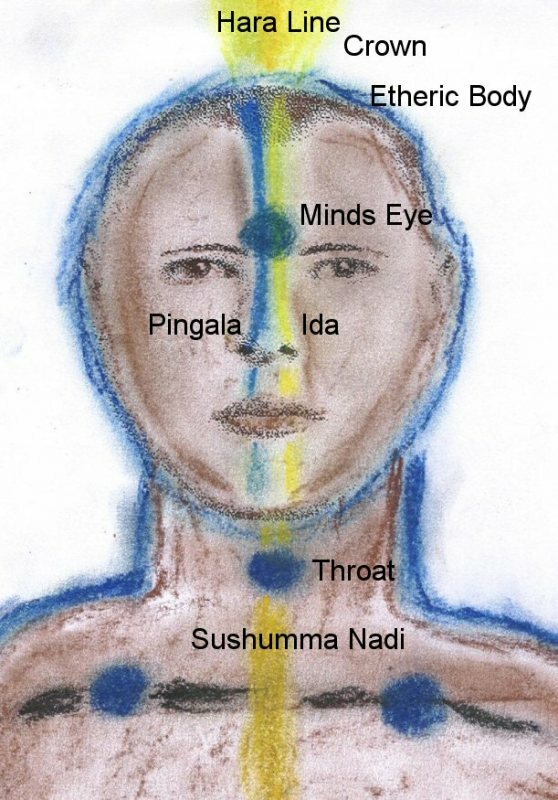 Below that we find the throat chakra, and the channels passing between the arms. The minor centre on the right side is associated with the earthstar. While the centre on the left side, is linked with the higher self. The channel passing between the two is the sushumma nadi, which is, where hara line and kundalini is stored. The thin blue layer around the body is known as the etheric body.